Yet another week has flown by and I am scratching my head wondering where did it go? I know I was a busy mummy but gosh at the blink of an eye time is passing me by and before I know it I'll have a little boy running around like a crazy person. Tige is 9 weeks on Monday and on Friday he had his 2 month immunisations, poor little poppet. He was none too pleased when he got the jabs especially as he was sound asleep after a nice belly full of milk. Anyways it has to be done and its done until his next round of shots... still it broke my heart to hear that scream, all I can say is thank the lord there weren't tears that would break my heart...hmmm thats got me wondering when will my bubba make tears? 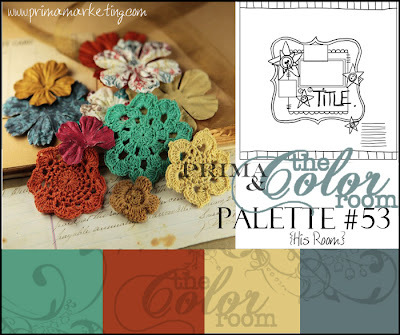 Anyways with a new week comes a new palette at 'The Color Room' and this week's #53 is a gorgeous color story from the His room collection. Here's my take on the palette and below it the palette itself. A big thanks for stopping by I hope I get time to pop into everyones blog this week, its been frantic for a while now and I feel like I have a big blog world catch up to do! I love seeing your takes on the colour palettes. They are SO different to how I would tackle them but I just love your layouts so much. so very clever. School hols next week so I will be home! What a super layout! I love how you put so many layers and details in, but with lots of white space too. Stunning!